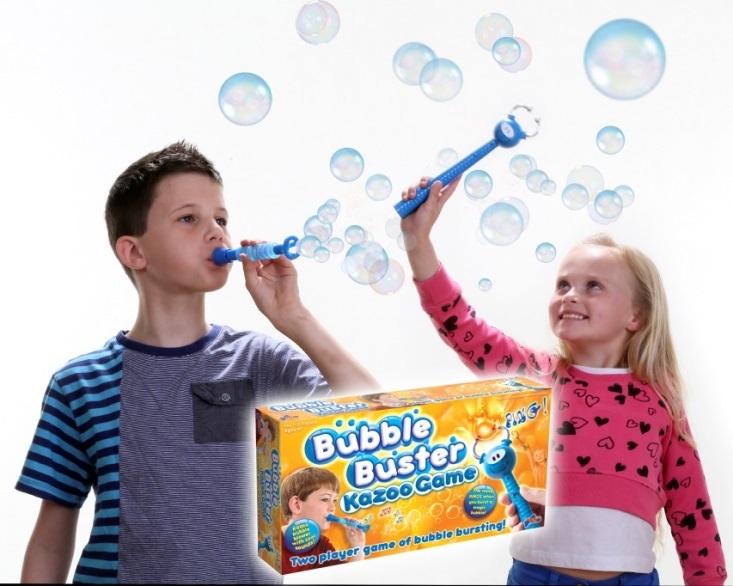 A perfect Summer ‘run-around’ game - The new two-player Bubble Buster Kazoo Game (rrp £9.99, for ages 4+) from Drumond Park brings the magic of bubble-bursting to a thrilling new level! Its clever kazoo bubble blower and a ‘pinging’ electronic wand which counts how many bubbles the children have burst, will have little ones jumping for joy amid squeals of excitement and laughter! It's so easy to play. Player 1 takes the kazoo bubble blower and dips it in the bubble solution, creating wonderful streams of beautiful bubbles – complete with cool sound accompaniments. Player 2, meanwhile, dashes around bursting as many bubbles as he or she can, in a 30-second time slot. The wand emits a thrilling ‘ping’ with every bubble burst, rising in pitch (in tune with the excitement!) as more and more bubbles are recorded! 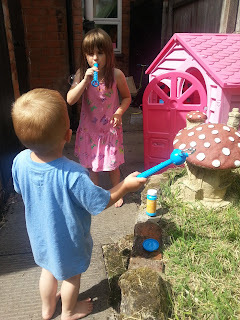 Our Review: We were sent our very own Bubble Buster Kazoo Game last week to have a play with. It's a very simple game that's so easy to play and quick to get started. 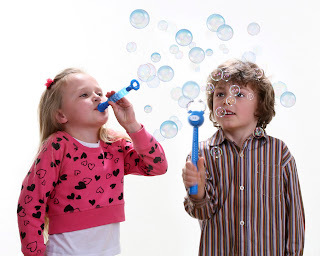 My three love bubbles but there's so many complicated bubble blowers out there now that it kind of spoils the fun. 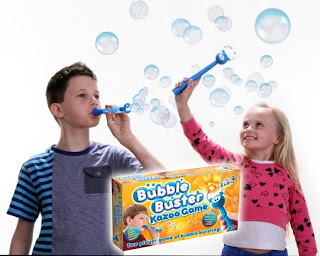 With the Bubble Buster Kazoo Game it's so easy to make lots of bubbles that it puts the fun back into it. 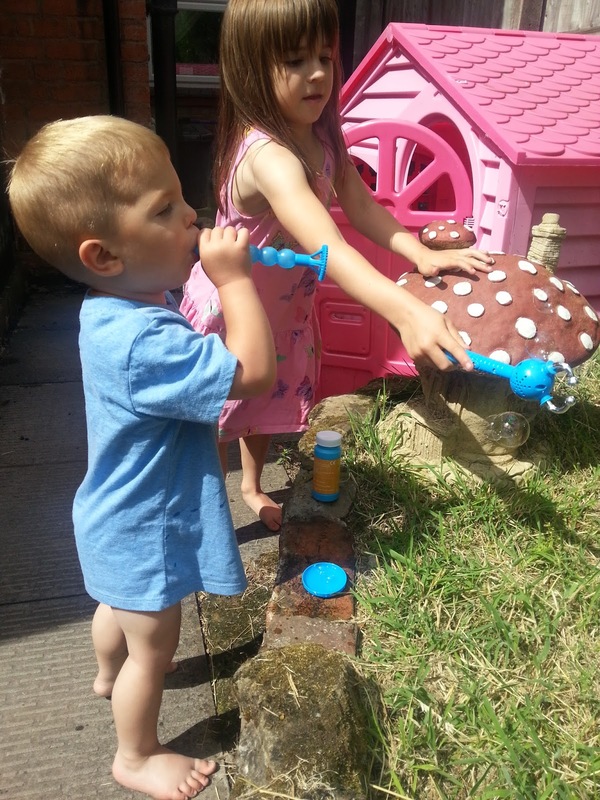 Bubbles are meant to be caught and popped and with the new Ping it wand it makes doing it even more fun. My three loved this game, it's provided hours of bubbly fun already and I'm sure it will continue to do so for the whole summer! 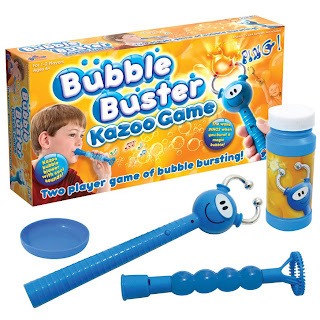 The Competition: Here's how you can win your own Bubble Buster Kazoo Game. Trouble, which can lead to rubble ... I'll stop now! As my hubby whould say " A bit of a barney..barney rubble trouble"
Has to be trouble with my two.